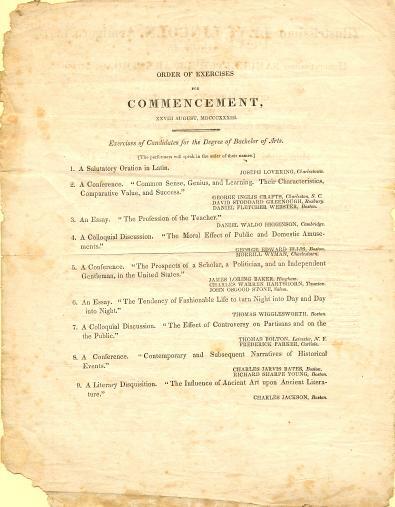 Rare Original Harvard Commencement Graduation Program dated August 28, 1833. 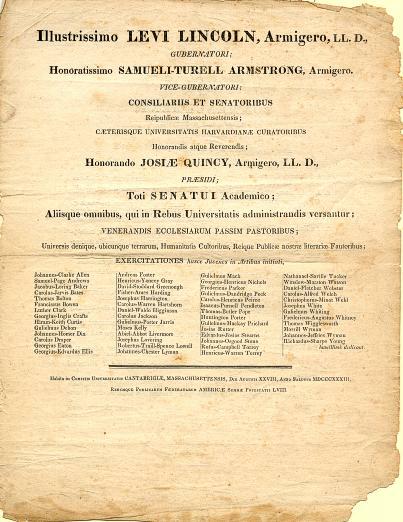 Josi E. Quincy was the President of Harvard University and Samuel Turrell Armstrong in 1833. 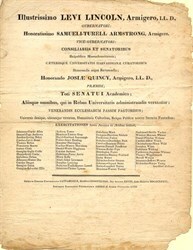 The first page of the program is in Latin and lists the graduates. This historic document shows signs of wear as can be seen on the scans, however the paper is not brittle. Habita in Comitiis Universitatis CANTABRIGL�, MASSACHUSETTENSIS, Dir Augusti XXVIII, Anno Salutus MDCCCXXXIII, Rerumque Publicarum Foederatarum AMERIC� Summ� Potestatis LVIII. 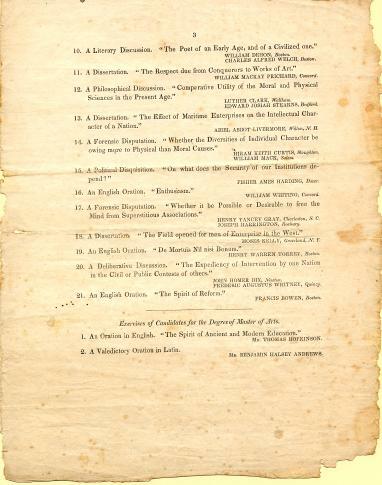 ORDER OF EXERCISES FOR COMMENCEMENT, XXVIII AUGUST, MDCCCXXXIII. Exercises of Candidates for the Degree of Bachelor of Arts. 1. A Salutatory Oration in Latin. JOSEPH LOVERING, Charlestown. 2. A Conference. "Common Sense, Genius, and Learning. Their Characteristics, Comparative Value, and Success." GEORGE INGLIS CRAFTS, Charlestown, S. C. DAVID STODDARD GREENOUGH, Roxbury. DANIEL FLETCHER WEBSTER, Boston. 3. An Essay. "The Profession of the Teacher." DANIEL WALDO HIGGINSON, Cambridge. 4. A Colloquial Discussion. "The Moral Effect of Public and Domestic Amusements." GEORGE EDWARD ELLIS, Boston. MORRILL WYMAN, Charlestown. 5. A Conference. "The Prospects of a Scholar, a Politician, and an Independent Gentleman, in the United States." JAMES LORING BAKER, Hingham. CHARLES WARREN HARTSHORN, Taunton. JOHN OSGOOD STONE, Salem. 6. An Essay. "The Tendency of Fashionable Life to turn Night into Day and Day into Night." THOMAS WIGGLESWORTH, Boston. 7. A Colloquial Discussion. "The Effect of Controversy on Partisans and on the Public." THOMAS BOLTON, Leicester, N. Y. FREDERICK PARKER, Carlisle. 8. A Conference. "Contemporary and Subsequent Narratives of Historical Events." CHARLES JARVIS BATES, Boston. RICHARD SHARPE YOUNG, Boston. 9. A Literary Disquisition. "The Influence of Ancient Art upon Ancient Literature." CHARLES JACKSON, Boston. 10. A Literary Discussion. "The Poet of an Early Age, and of a Civilized one." WILLIAM DEHON, Boston. CHARLES ALFRED WELCH, Boston. 11. A Dissertation. "The Respect due from Conquerors to Works of Art." WILLIAM MACKAY PRICHARD, Concord. 12. A Philosophical Discussion. "Comparative Utility of the Moral and Physical Sciences in the Present Age." LUTHER CLARK, Waltham. EDWARD JOSIAH STEARNS, Bedford. 13. A Dissertation. "The Effect of Maritime Enterprises on the Intellectual Character of a Nation." ABIEL ABBOT LIVERMORE, Wilton, N. H.
14. A Forensic Disputation. "Whether the Diversities of Individual Character be owing more to Physical than Moral Causes." HIRAM KEITH CURTIS, Stoughton. WILLIAM MACK, Salem. 15. A Political Disquisition. "On what does the Security of our Institutions depend?" FISHER AMES HARDING, Dover. 16. An English Oration. "Enthusiasm." WILLIAM WHITING, Concord. 17. A Forensic Disputation. "Whether it be Possible or Desirable to free the Mind from Superstitious Associations." HENRY YANCEY GRAY, Charleston, S. C. JOSEPH HARRINGTON, Roxbury. 18. A Dissertation. "The Field opened for men of Enterprise in the West." MOSES KELLY, Groveland, N. Y. 19. An English Oration. "De Mortuis Nil nisi Bonum." HENRY WARREN TORREY, Boston. 20. A Deliberative Discussion. "The Expediency of Intervention by one Nation in the Civil or Public Contests of others." JOHN HOMER DIX, Newton. FREDERIC AUGUSTUS WHITNEY, Quincy. 21. An English Oration. "The Spirit of Reform." FRANCIS BOWEN, Boston. Exercises of Candidates for the Degree of Master of Arts. 1. An Oration in English. "The Spirit of Ancient and Modern Education." Mr. THOMAS HOPKINSON. 2. A Valedictory Oration in Latin. Mr. BENJAMIN HALSEY ANDREWS.